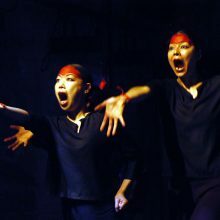 Our inaugural performance, "Bandh: Meditation on Dream," is an evening-length dance theatre piece that is a journey into a state of being where we are able to focus on the desires, hopes, and aspirations that sustain life, and that enable us to look beyond logistical details that are necessary for mere survival. We believe that women’s dreaming, including their resistance, their reaching for beauty, their claiming of space on their own terms, has generated healing and life-sustaining forces throughout time. Bandh explores and celebrates such dreaming. 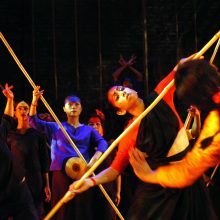 Structured in three movements, Bandh moves from scenes of despair and death, through an awakening of dreams, to a celebration of feminine sensuality inspired by chalaman bigraha (moving deities) of Bengal and Odisha – goddess images carried in ritual processions through villages and towns. 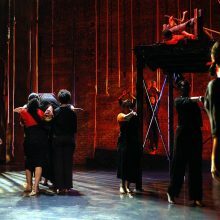 The dismantling of a tall wooden altar, downstage left, marks its transformation from a place of sacrifice of women to one that empowers their journey at the end of the show. Performers: Shubha Mudgal (vocal), Murad Ali (sarangi), Chris Powell (acoustic guitar, additional percussion), Brennon Denfer (bass guitar), Aneesh Pradhan (tabla, percussion), Pratap Rath (additional percussion). Lyrics: Bol Ke Lab Azad Hain Tere by Faiz Ahmed Faiz; Tarpe Bin Balam Mora Jiya by Kabir. Many thanks to Salima Hashmi and Moneeza Hashmi for permission to use Faiz Ahmad Faiz’s poetry. Recorded by: Chris Powell; Julius Packiam at BPM Studios, New Delhi; Roopak Chaudhuri at Sonic Trance Studios, New Delhi. Mixed and mastered by Tanay Gajjar at AVA Studios, Mumbai. Special thanks to Chris Powell for help during all recording sessions. 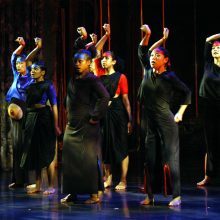 Referring to images of dancing women in the caves of Khandagiri and Udaygiri dating back to 100 BC, scholars have argued that contemporary Odissi emerges from one of the oldest dance forms in India. There is much evidence that this older dance form, referred to as Odra-Nrutya (dance from the Odra-desa region, which corresponds to modern-day Orissa) was a rich and highly nuanced form, and was flourishing by the 1st century BC. 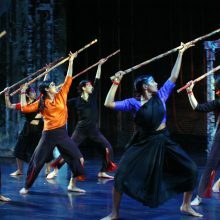 Odissi was named as such in 1955 by poet, playwright, and musicologist, Kalicharan Patnaik, signaling a clear regional and cultural specificity: Odissi is the dance form that emerges from and belongs to the state of Orissa. 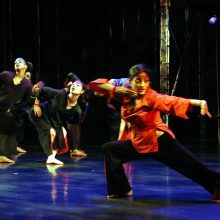 Encouraged by royal and temple patronage, Odissi developed came to be developed from (9th century on, through the dance of the maharis, women dedicated to divinity to perform temple rituals and to dance in the natamandap, (the dance hall, a central feature of Orissa’s temples) as spiritual offering to the deity. Later, in the 17th century, the gotipua tradition developed under the sponsorship of royal and wealthy families, mostly in akhadas or gymnasiums, to encourage physical training and preparation as warriors in case of need at the time of foreign attacks. Here, young men danced dressed as women, performing a strongly acrobatic style referred to as bandha nrutya. The mahari style, in contrast, was characterized by sensuality, an exploration of erotica, and a celebration of female energies. Today’s Odissi style, marked by sculpturesque poses (bhangi), subtle torso movement (bakshya chalana), displaced hip positions (as in the tribhangi position), rhythmic play, and expressive dance (abhinaya), is a combination of both styles. This form is a result of much reconstruction undertaken in 1940’s and 50’s by leading gurus such as Guru Pankaj Charan Das, Guru Kelucharan Mohapatra, and Debaprasad Das, who painstakingly re-created Odissi, which had degenerated during the colonial rule, based on evidence from texts, a plethora of sculptures and paintings. The aesthetic framework for Bandh is also particularly inspired by the yogini temples, many of which are located in the heart of Orissa’s villages. The circular temples of Hirapur, ascribed to the 8th-9th centuries, and of Ranipur Jharial dated at 8th century AD, for instance, are dedicated to these female saints and their walls are sculpted with images of these yoginis dancing in spiritual ecstasy, richly sensuous. These images meld with inspirations from Bengal’s rich tradition of devi-puja or goddess worship, where the ritual worship of feminine energies concentrated in female bodies is a central part of the culture. Here, goddesses are also imagined as chalaman bigrahas, or moving images, and are often carried through the community in ritual procession by devotees. These ideas and images that have a long legacy in their particular contexts flow into a contemporary context as they invigorate these women’s reaching for their dream-state. 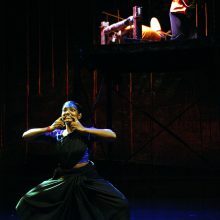 As such the choreography has been created as much from the abstraction of these images, deconstruction of the movement traditions from Orissa and Bengal, India, and from ideas developed and workshopped by participants of this project on ideas of dream and a celebration of feminine energies. There are times when commonalities of approach seem to almost suggest that ideas could fall into place despite their having emerged in different geographical spaces and time. The same seems to have happened during our interaction with Ananya over the past year or so. Beginning with our initial meeting over two consecutive days in Kolkata and spreading over the many emails and sound and video samples that we exchanged, the dialogue grew only because we were ideologically motivated by essentially the same feeling of ‘breaking loose’, of ‘freedom’, of ‘pushing forward together’. Much of our work in composition since 2002 has been provoked by the social and political milieu that we found ourselves in. Our response to the situation around us seemed to be poignantly mirrored in the eminent poet Faiz Ahmed Faiz’s ‘Bol ke lab’, and it was almost uncanny that Ananya should also feel equally compelled to use this piece in Bandh as soon as she heard bits of it during one of our meetings. Act 1 with its jagged sounds and the subsequent dirge-like vocal quality inspired by the traditional Soz and Marsiya forms heard in the Indian subcontinent during the Muslim month of Muharram that recount tales of valour, suffering and grief to follow the sacrifice of supporters of the Prophet seeks to establish a dark and sombre mood. Act 2 begins with a lyrical dreamlike sequence that juxtaposes the melodious vocal line with an almost unpredictable percussive arrangement. 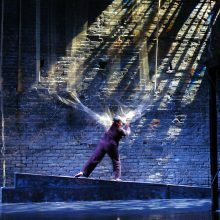 It moves into a section where the voice and electronic music seem to merge and yet form disparate lines to accentuate the tension between the dream and the struggle to reach for it. 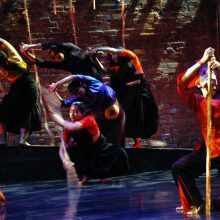 The second act closes with the sounds of bells that are reminiscent of the Yoginis or celestial incarnations of the female form making their entry into a worldly space. Act 3 starts with a deceptively slow melodic progression – deceptive because the urgency is felt not in the tempo of the phrases but in the choice of notes and the consonances and dissonances formed due to the improvisatory use of the whole tone scale – a scale that is so alien to Indian music. This leads into a more overt sense of urgency felt through the intense drumming and accompanying gongs adapted from the drumming of the Dhak and Kanshi during the annual Durga Puja celebrations.